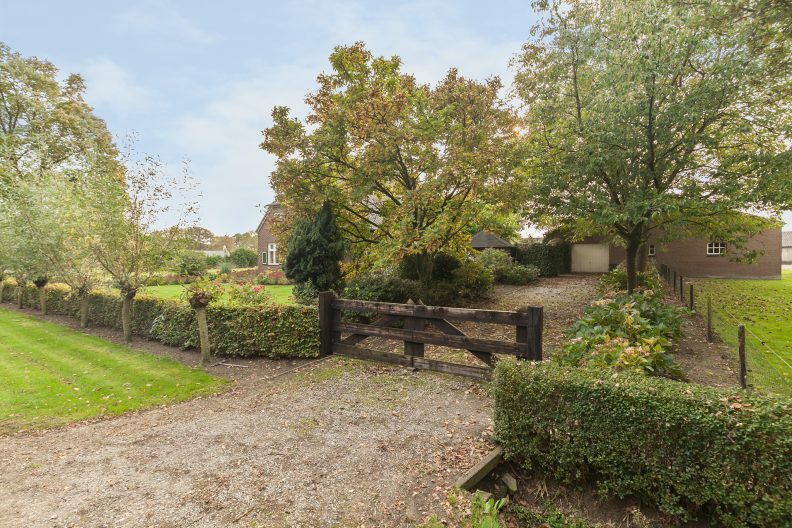 This detached farmhouse is located near the Equestrian Centre ‘de Peelbergen’ and includes several outbuildings and a spacious pasture. 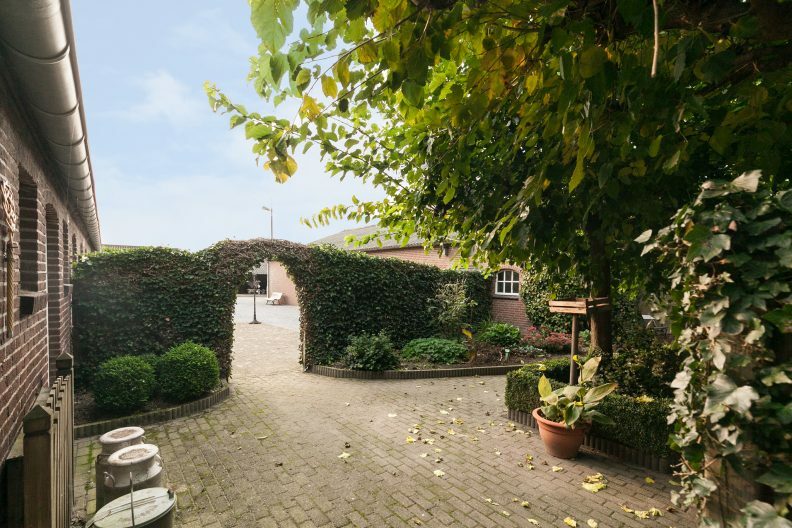 The farmhouse offers plenty of living space and the back house can be used for multiple purposes. 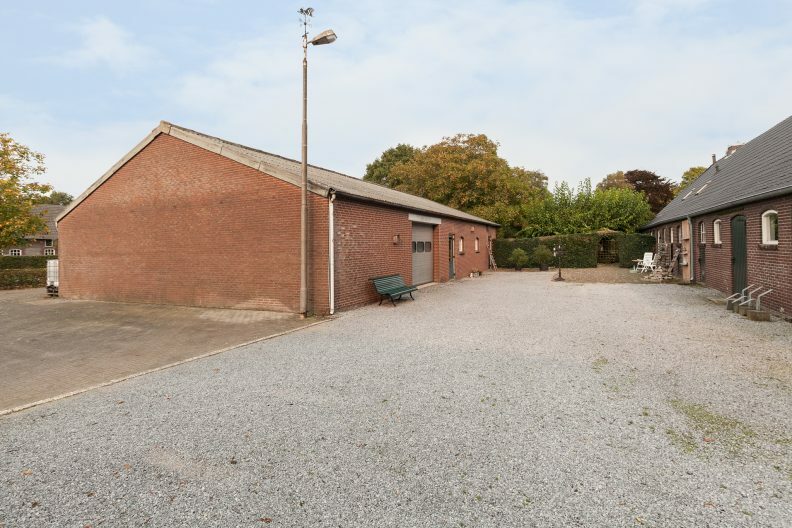 The plot of 13.440 m² offers the possibility for realizing an equestrian accommodation within the existing block. 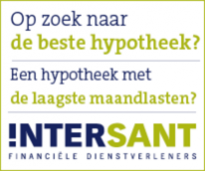 Located in the immediate vicinity of access roads and highways in the direction of Venlo, Eindhoven, Nijmegen and Maastricht. The hallway features a tiled floor, stucco walls and a wooden ceiling. The meter cupboard and stairs to the first floor are situated here. The spacious living room has been considerably increased in size by adding the former kitchen to the living room. 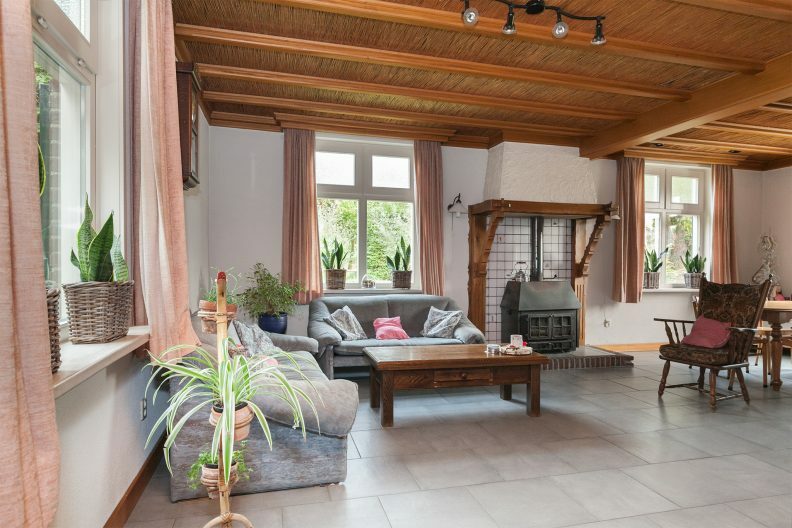 The entire living room is finished with a tiled floor with underfloor heating, plaster walls and a ceiling which is part wooden beam and part panels. 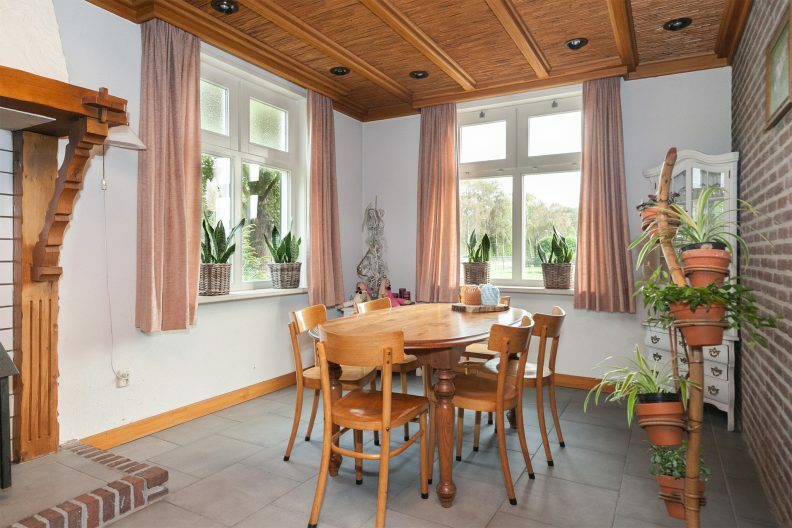 A characteristic tiled mantel with wood burner provides extra warmth and a cosy atmosphere. 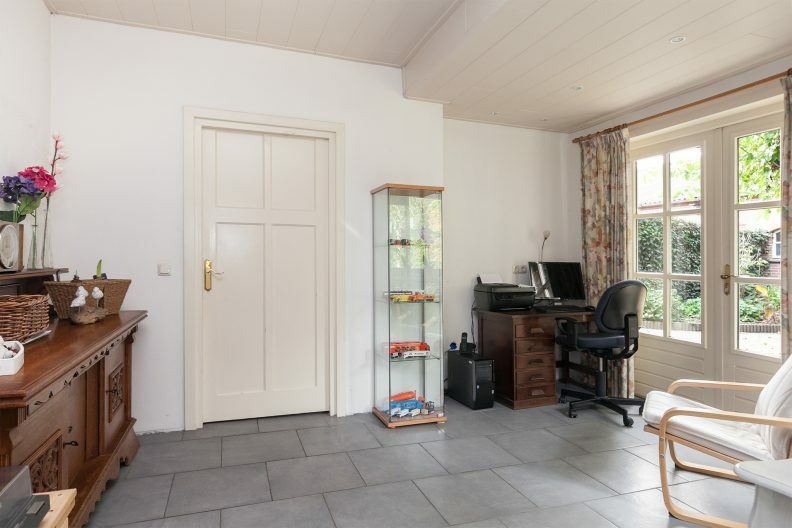 The extra space is set up as a work space / computer room with access to the terrace through French doors. The basement is accessible from the living room through a wooden staircase and is finished with a concrete floor, stucco walls and a stucco ceiling. The floor heating unit is situated in the basement and a skylight provides natural ventilation and light. 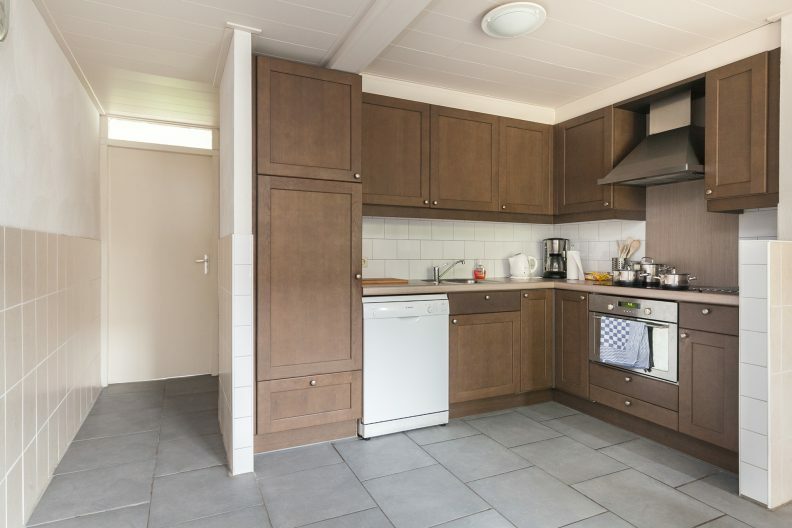 The kitchen is equipped with a corner kitchen unit that was renovated in 2008. It features 1½ sinks, a ceramic cooker, microwave combination, a refrigerator and a dishwasher. The kitchen is partly tiled and is finished with a panelled ceiling. There is also a fitted cupboard for extra storage space. From the kitchen a corridor provides access to the bathroom on the ground floor and the pantry. 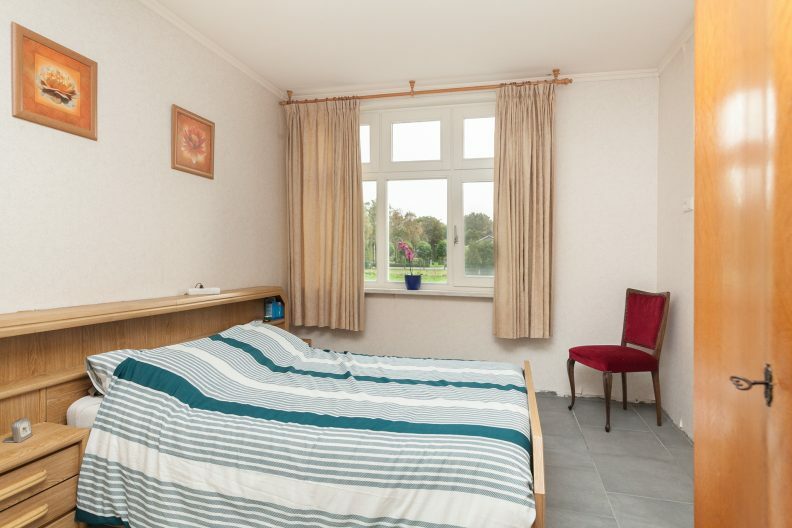 The spacious master bedroom on the ground floor enjoys lots of light. The room is finished with a tiled floor with underfloor heating, wallpaper walls and a stucco ceiling. The bedroom has an en-suite bathroom. 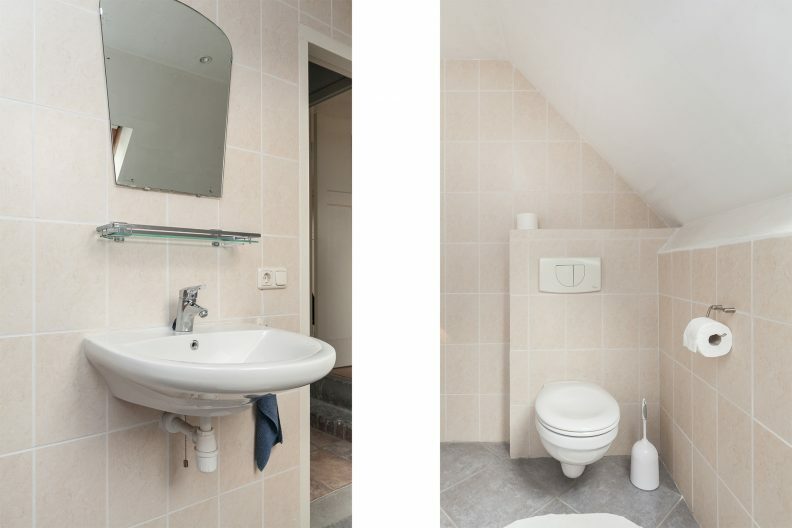 The fully tiled bathroom was redone in 2009 and equipped with a bath, walk-in shower, floating toilet and double sink. 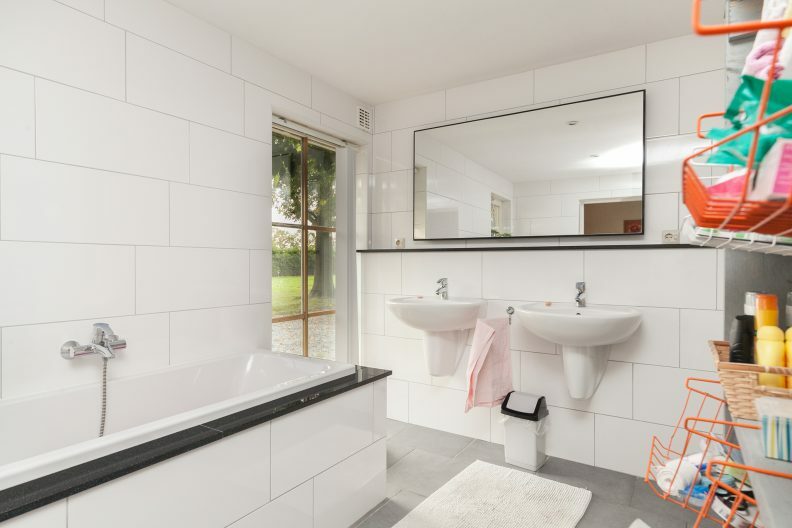 The bathroom also features underfloor heating. 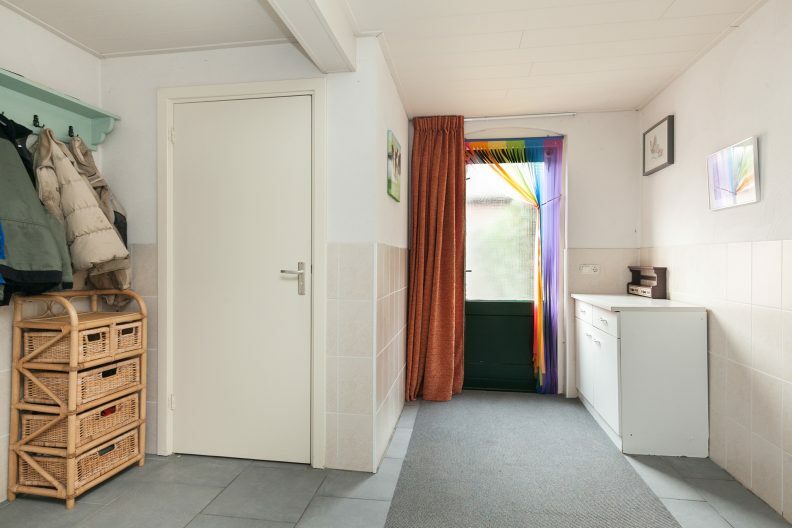 A short corridor connects the bathroom to the kitchen. A spacious rear portal is accessible through the kitchen and a door from the back yard. 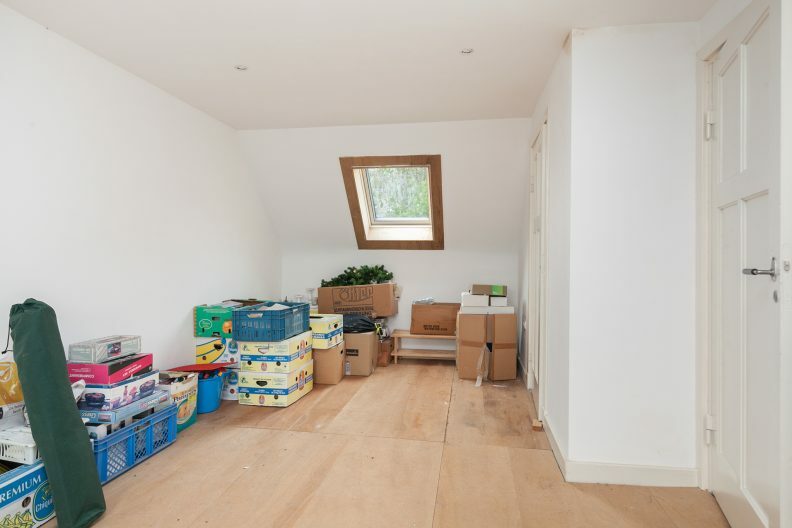 This space is partly tiled and equipped with underfloor heating. 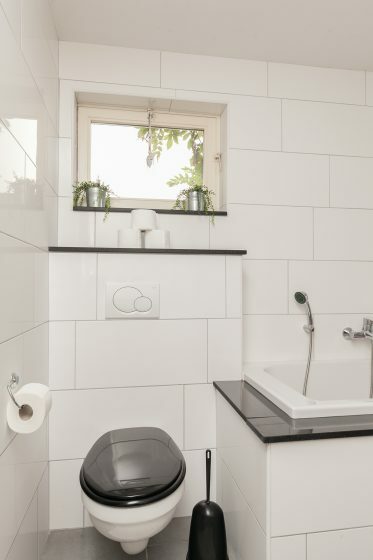 The partly tiled toilet area is equipped with a wall-hung toilet, a wash basin and natural ventilation. 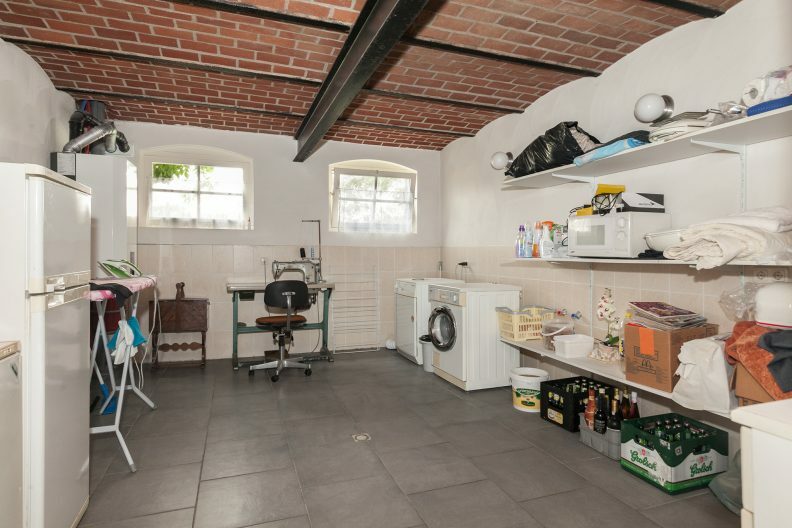 The spacious, partly tiled pantry features a characteristic vaulted brick ceiling. Connections for washing equipment and white goods are available in this area, as well as the central heating boiler setup (Daaldrop, circa 2009). 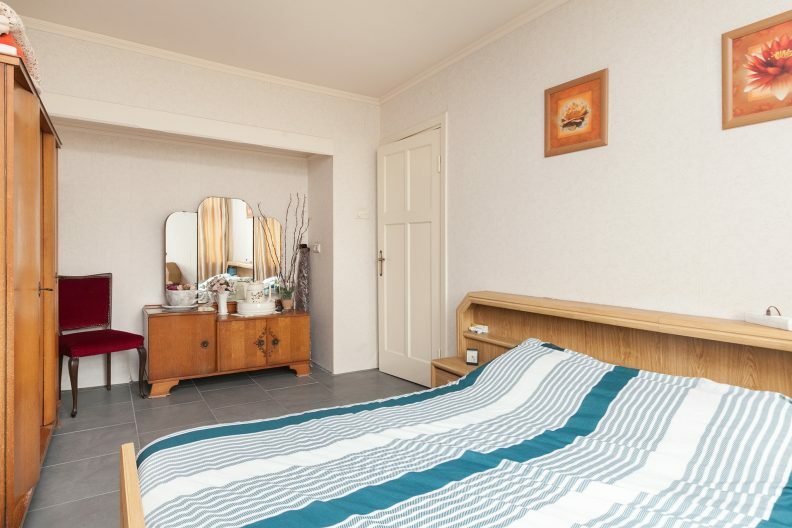 The rear annex is divided into several, multifunctional rooms and has been partly modernized. 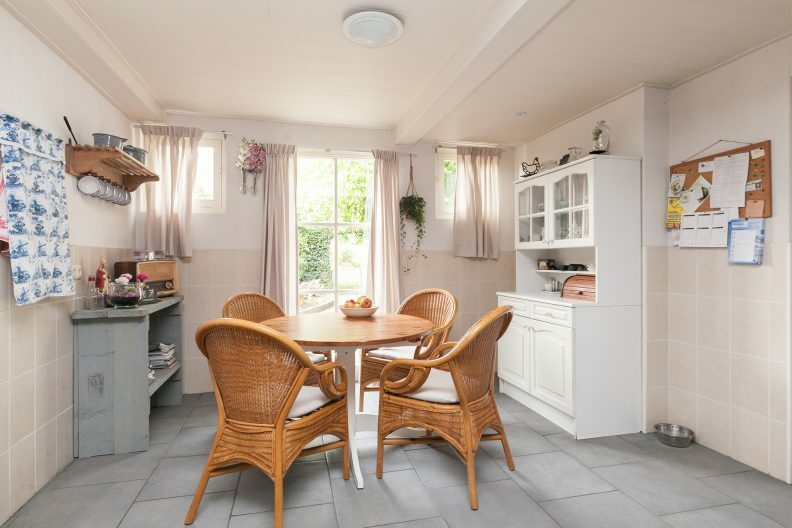 The storage that is accessible from the rear portal is equipped with a kitchen unit containing a sink, oven, ceramic cooker and cupboard space. 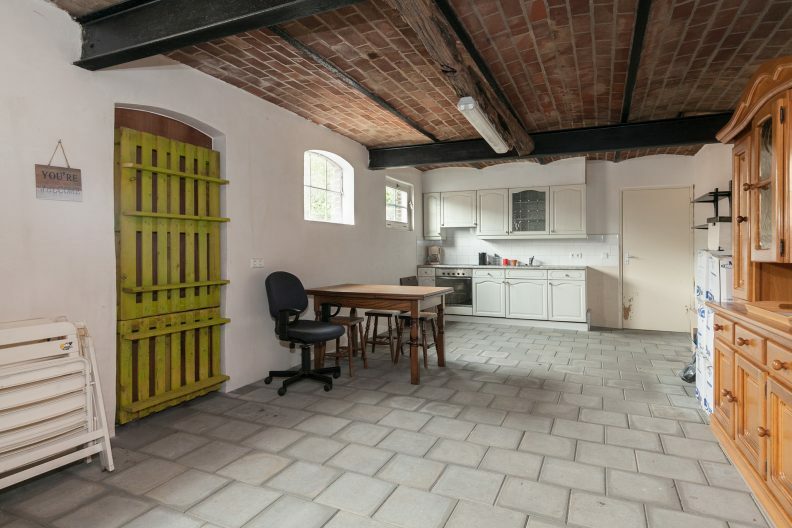 The space is finished with a concrete tile floor, stucco walls and here also a beautiful vaulted brick ceiling. The second storage room is finished with a concrete tile floor, stucco walls and ceiling. A fixed staircase provides access to the large attic. 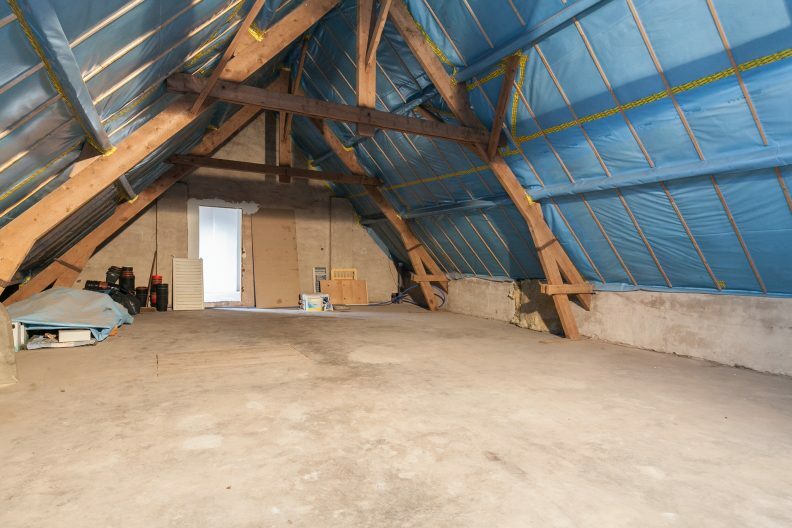 The large multifunctional attic has a concrete floor, beautiful wooden trusses and an insulated roof. 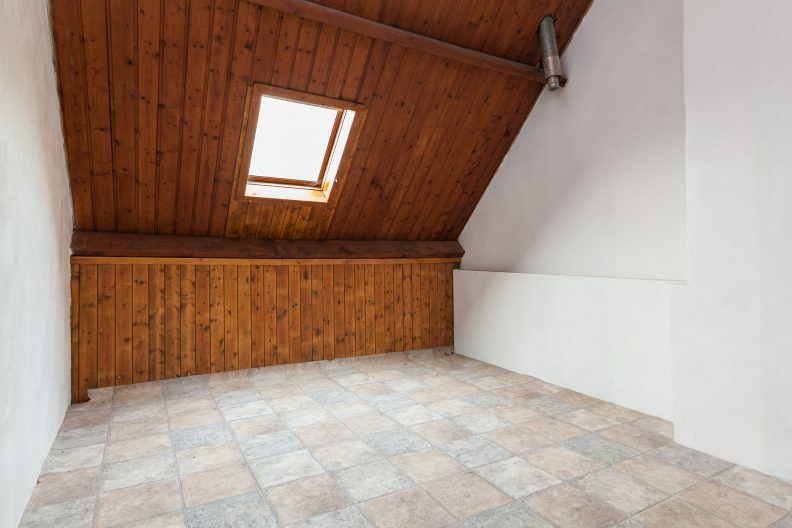 The attic offers plenty of space for the realization of several rooms and gives direct access to the first floor of the living area. The indoor barn has a concrete floor, masonry walls and wooden trusses.It is finished with a concrete floor with grids. The slurry pits are still present, but no longer in use. The stable setup has also been completely removed. A door in the sidewall provides access to the yard. There is also access from the shed to the animal enclosure. The landing is carpeted and features stucco walls and a wooden ceiling. The space is equipped with a built-in wardrobe and all doors are original panel doors. Bedroom 1 and 2 have a vinyl floor, wallpapered walls and a wooden ceiling. Both bedrooms feature built-in wardrobes. 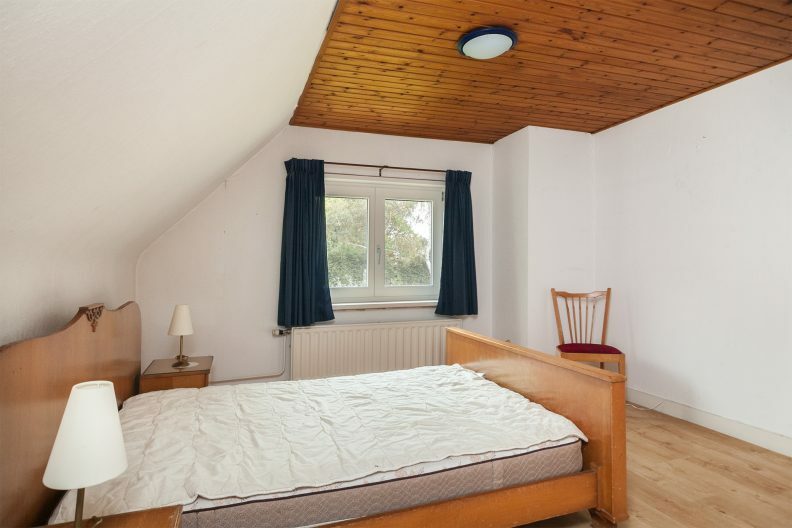 The 3rd (bed) room enjoys a lot of light thanks to two roof windows, features a built-in wardrobe and a hatch to the attic above the living area. 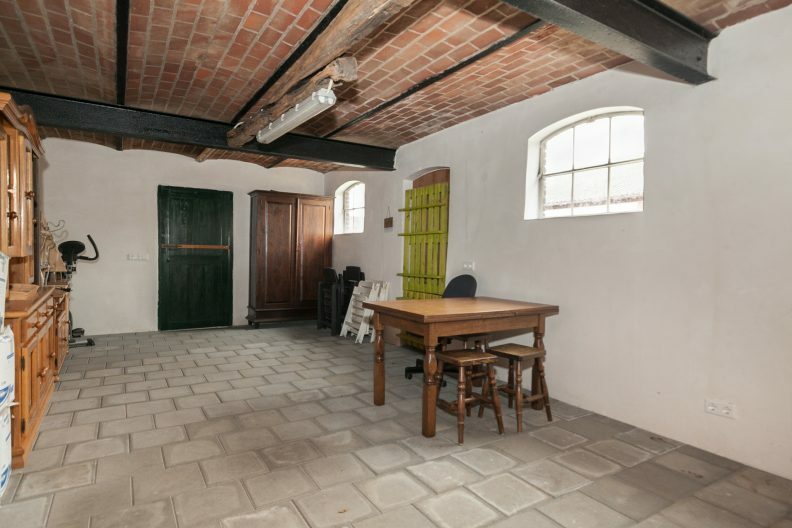 The space has wooden floors, stucco walls and a stucco ceiling. 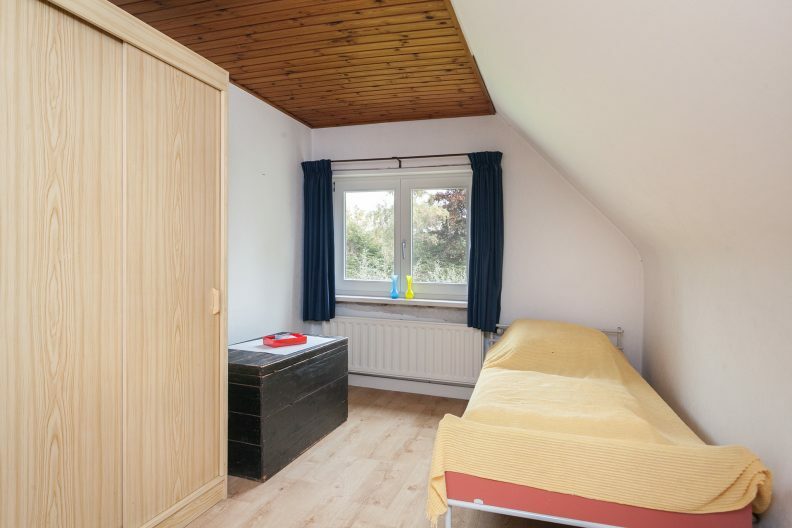 The 3rd (bed) room offers access to a fourth room on the first floor, which is also accessible from the large attic. This (bed) room has a wooden floor, which is currently covered with vinyl. The timber-clad ceiling gives visibility to the ridge of the roof. A roof window provides a lot of light. 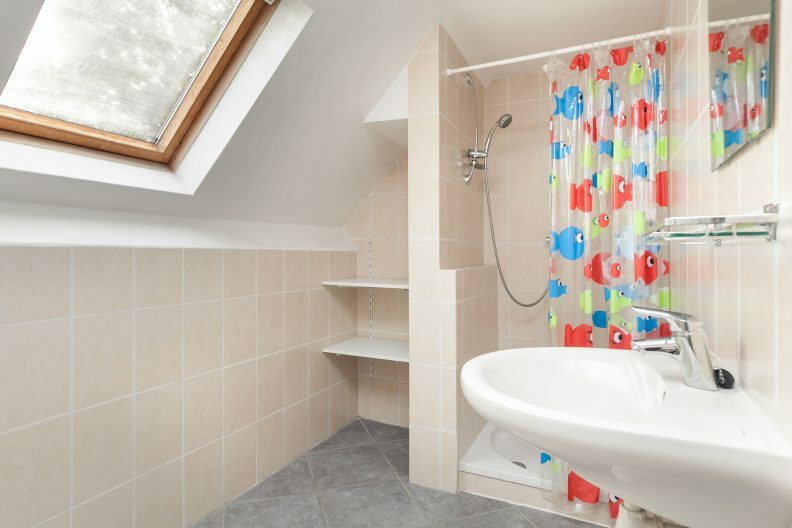 The room has an en-suite bathroom, which is equipped with a shower, wall-hung toilet, sink and a roof window. 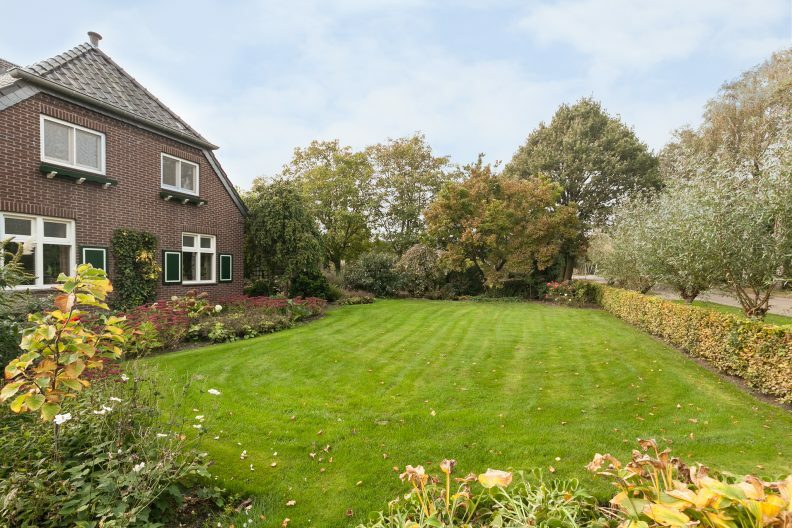 The main garden is situated at the front and right side of the farmhouse. The garden features a large lawn, a spacious terrace on the side of the main building and border planting with perennials. There is a pasture with a wooden animal enclosure. 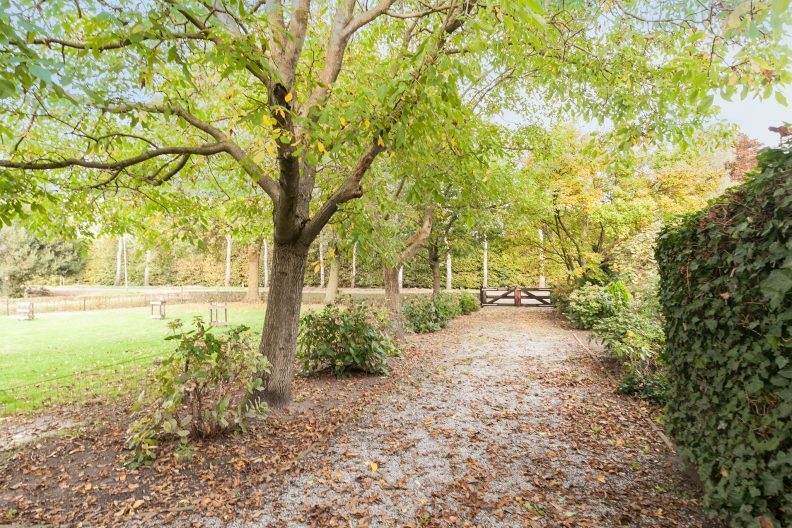 The yard is paved and accessible through 3 driveways. Warehouse: The warehouse (approx. 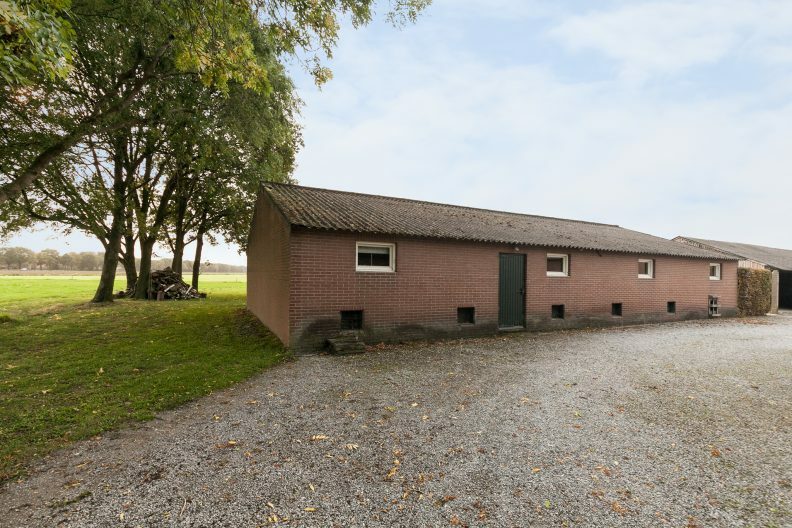 275 m²) was built in the 1990s, features a concrete floor, is constructed from masonry with steel trusses and the insulated roof is covered with corrugated asbestos sheets. The building is accessible through 2 doors, a steel up-and-over door and 2 manually operated roller doors (one of which is 3.80m high). 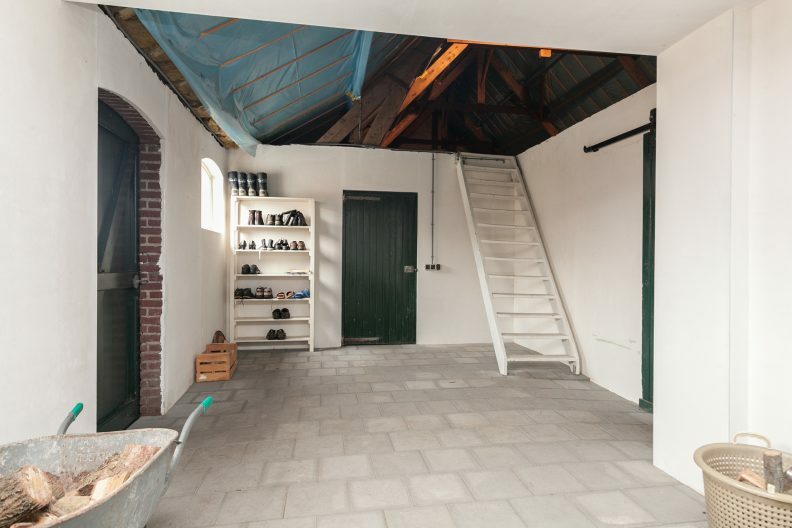 The warehouse has a private driveway and could easily be used as a stable or storage space. This former pigsty (circa 190 m²) is built out of bricks and the roof is covered with corrugated asbestos sheets. The stable has a central corridor with three sections which have been emptied. There are a number of doors in the front and side facade giving access to the yard. The slurry pits are still present. 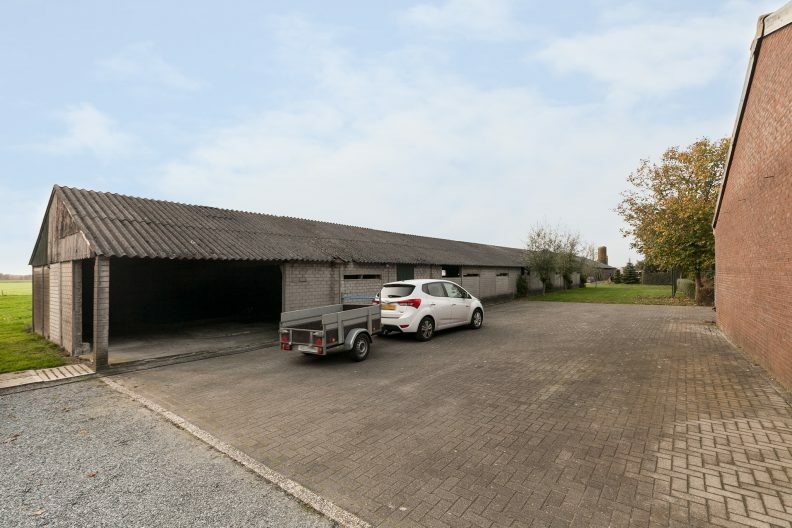 The 2nd stable (circa 300 m²) consists of a carport with an open front and a closed off section. 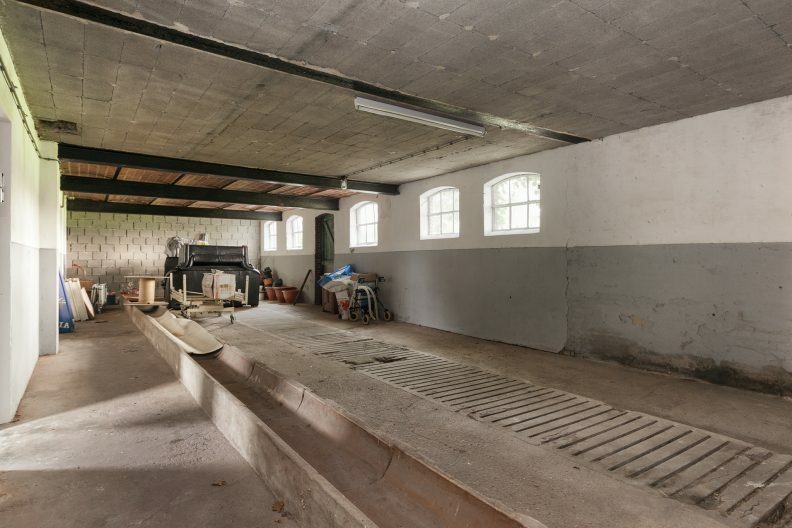 The carport section features a concrete floor, wooden frames and masonry walls. The roof is covered with corrugated asbestos sheets. The enclosed area can be entered via a door in the front. This part is also equipped with masonry facades, wooden trusses and a roof with asbestos corrugated sheets. There is no paved floor in this section. The access from the side wall to the yard is open. The out-dated field barn has an open front and has concrete walls and wooden trusses. The roof is covered with corrugated asbestos sheets. 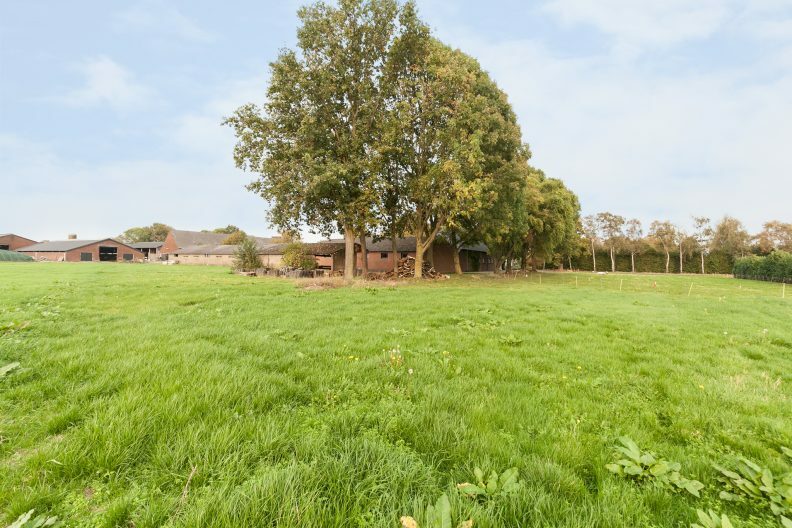 The meadow is situated at the rear of the outbuildings and the left of the farmhouse. Contents farmhouse: circa 850 m³. 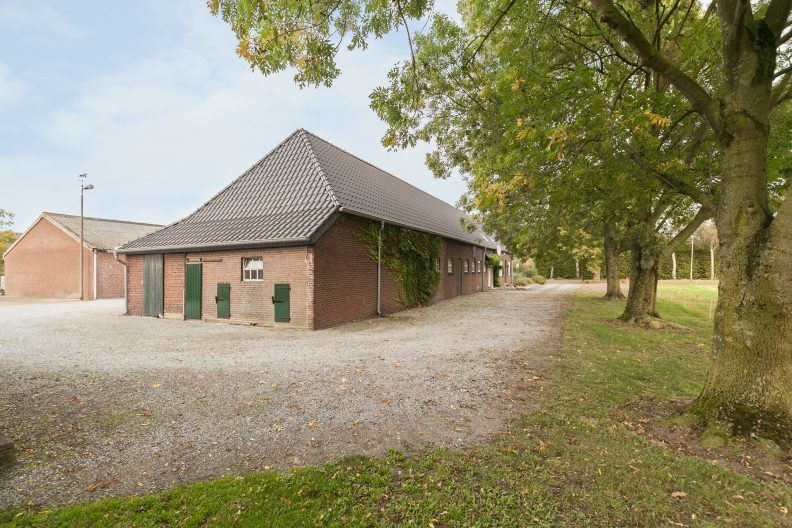 Area farmhouse: circa 190 m2. The property is connected to gas, water, electricity and plumbing. The roof was completely renewed and isolated in 2008. The ground floor of the living area has underfloor heating. The window frames were renewed in 2008 and fitted with double glazing. The farm has cavity walls, they have not been insulated. 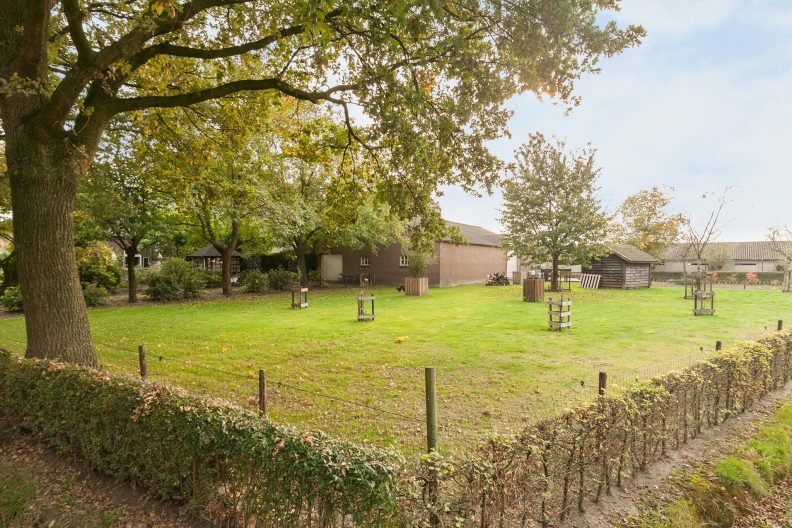 Located in a beautiful location, in the immediate vicinity of Equestrian Centre ‘De Peelbergen’ and a nature reserve. Unobstructed view at the back! Good accessibility, the A67 motorway (Venlo-Eindhoven) is reachable within 10 minutes. The railway station Horst-Sevenum is located about 10 kilometres away.